You heard about it here first | Me fail? I fly! Longtime resident David Lawrence tends to the roadside garden regularly and is mystified as to who placed the statue there. ‘It can be put down as a true Annandale mystery,’ Mr Lawrence said. ‘He seems to be collecting something, maybe it’s part of a bigger theme, who knows. He said locals have largely welcomed the new addition, and would like to know who created the work of public art. Well, as regular readers of this blog know, it’s an open secret. It’s nice to see it become a mystery. Later addition: Two things have happened in the hours since I posted that. 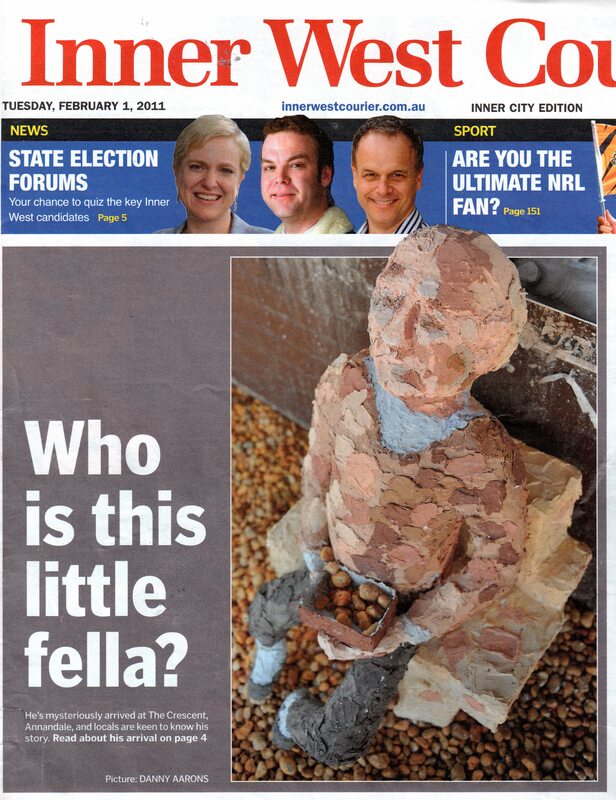 The Art Student identified herself as the sculptor on the Inner West Courier site (over my objection that by doing so she was depriving the Inner West readers of the pleasure of a mystery). We found a copy of the paper and discovered that the front page photo is much more impressive than the one reproduced on the web (both by Danny Aarons). Here’s part of the front page, for those unfortunate enough not to have the Inner West Courier delivered to their door. This entry was posted in Around Annandale, Vicarious vainglory and tagged art, Penny Ryan. Bookmark the permalink. I just saw this this morning. It did make me laugh. I hope they publish a photo of her next week!